The runway extension is heavy production, the terminal is almost complete and we’re just a few short months away from seeing those beautiful canyon blue jets flying over our beaches. Here are the latest aerials of the brand new, but not yet completed Northwest Florida Beaches International Airport. I didn’t take them, JoeBay Aerials did. Great pictures and we really appreciate the ongoing updates of the construction progress on this tremendous facility. oh, my bad. I guess I could have figured that. I mean, seriously, how could you have gotten that high. I mean, I know you’re a good jumper and all, but that would be a little insane. Merry Christmas to all of you in PCB! Wish I were able to be there during the holidays~! I’m sure you have sunny skies! Wow it is coming along fast. The terminal looks similar to Ft. Walton Beach or what ever it’s name is NOW. I think it has changed name like 6 times in the last year. Oh those powers to be. Any idea haw many flights per day are scheduled? Wow, it looks like they could open a cable park on the end of the runway. That would be awesome. Look at all that water! Those retension ponds..I mean lakes, are really being put to the test. The first one looks to tiny! For some reason I’m not too impressed with the progress…. almost like it has been going backwards… I would really start to speed things up. Whats’ up with the terminal roof?? Great pictures! As far as employment for the new airport —- would you have heard the where, when and how’s of the application process? The month of May is not all that far away — I would think they would start looking for employees as soon as possible. I have a lot of unemployed friends — people who want to work — and are good, loyal and hardworking — who I have been trying to assist in finding them work. Jason — if you can — please advise. Thank You! Have a healthy, safe and comfortable New Year in 2010! where is the turn off to the airport from 79? We are in town for the holiday and we couldn’t see any marked exits. How far from Front Beach Road is the new airport? Last time we were down, the turnoff to the airport was on Hwy 388. 388 goes east off 79 at West Bay. Maybe a mile or two off 79 if I remember right. It’s about 7-8 miles from Front Beach road if memory serves. Not so impressed with the layout though. I’m delighted for the progress and moving forward in our area, but we need to do it in style. I’m sure the interior and face of the building will be stylish, I hope. I would have liked to have seen a more interesting and modern layout though. 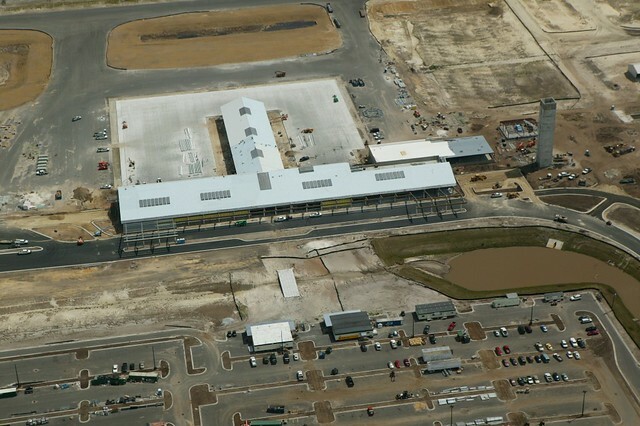 It looks really squared off like a big warehouse and it appears they modeled it after the Ft. Walton and PC airport. Why did the retention ponds have to be so close to the runways? They could have made them look more natural also. I hope it will look better when it’s complete. Hats off to all the hard work though. Please don’t take my criticism badly anyone, I just expect well thought out design projects with all aspects considered. We need to think outside the box when developing this area!